Unity Technologies has released the full executable and free downloadable packs of assets from Adam, the impressive photorealistic real-time demo it showed at GDC earlier this year. The release was announced at the company’s Unite Los Angeles 2016 conference, alongside details of Unity’s 2017 product roadmap. The enigmatic six-minute short shows the consciousness of human prisoners – perhaps convicted criminals – transferred into robotic bodies on what seems to be a prison planet. On its release, it was widely heralded as setting a new benchmark for complexity and photorealism in Unity, including some sophisticated lighting and post effects, volumetric fog, and an extensive crowd scene. The new asset packs – two character packs, plus interior and exterior environments, and lighting and volumetrics – provide a glimpse of how the demo was constructed. As it turns out, it wasn’t strictly real-time: a lot of the character animation was prebaked, and some of the character rigs only functioned in external DCC tools. 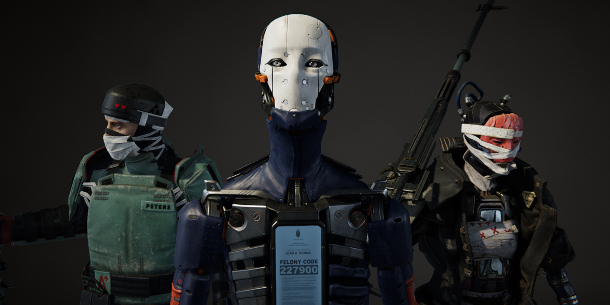 In the asset packs, the characters have been reworked for Unity’s standard humanoid rig, with an additional tool that “tries to replicate some of [the] shoulder functionality”. The original demo made “extensive use” of Next Limit’s CaronteFX add-on for cloth simulation, so the clothing has also been reworked for Unity’s standard physics. In addition, you can download a Windows executable version of the demo, which is expected to run at 30fps at 1440p resolution on a Core-i7 system with a GeForce GTX 980 graphics card. In it, it’s possible to move cameras or light sources in real time, but not to edit animation or simulations. The Adam asset packs are available now for free for Unity 5.4.1. Unity Technologies says that it doesn’t guarantee compability with other versions, including the current beta of Unity 5.5. In addition, several of the assets require Unity’s new post-processing effects stack, which is currently in beta, and which is available via GitHub. The environment and lighting packs are available for commercial use; the character packs for non-commercial use only.